—isn’t the Declaration of Independence. It’s a copy made by William J. Stone in 1820, which the government commissioned him to make because the original was basically falling apart even then. It’s well protected now, but according to the National Archives’ history of the document, it took some abuse early on, partly because Congress had to keep moving it (and themselves) to avoid the British. It probably had at least seven different homes during the Revolutionary War, and then of course they had to move it again in 1814 for the same reason as before. Also, they kept making copies, which is understandable, but horrifying given that it was common at the time to make “press copies,” which “were made by placing a damp sheet of thin paper on a manuscript and pressing it until a portion of the ink was transferred.” Egads! Stone may actually have used this “wet transfer” process when he made his copy, which makes it a pretty good copy but may have jacked up the original. That is in sufficiently bad shape that many of the signatures are illegible at this point. Which is fine, because they weren’t there to begin with. 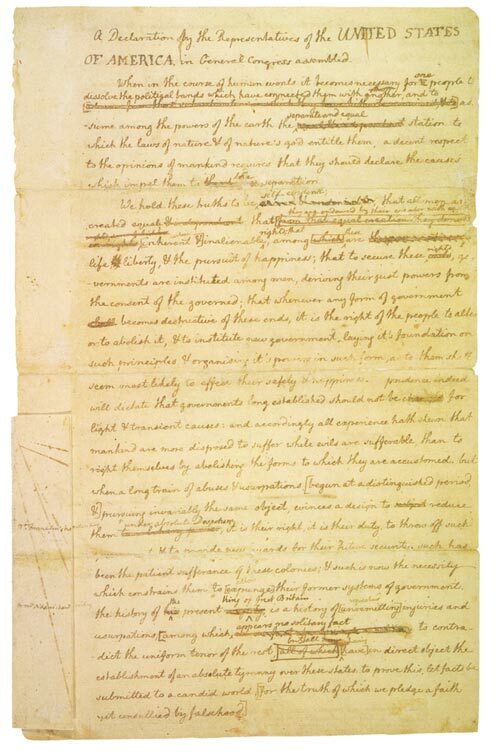 Jefferson then presented his rough draft to Congress, which spent the next two days revising it. (Among other things, they took out a comment about the King allowing the slave trade to continue, because … awkward.) 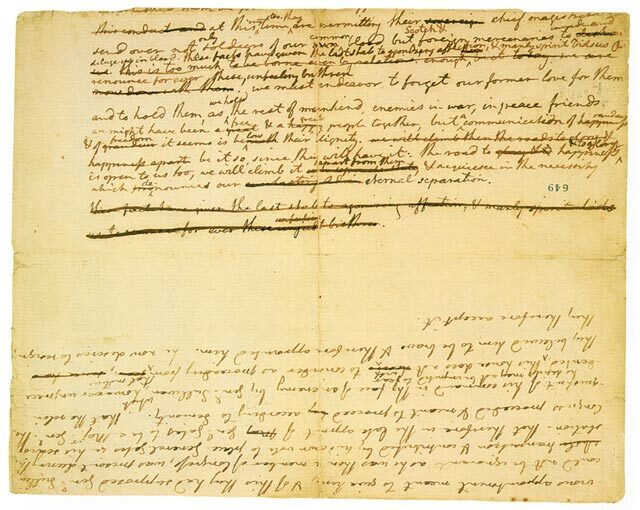 If you’ve ever written anything that’s then been revised by committee, you know just how irritating that can be, and Jefferson was duly irritated. But such is life. Anyway, on July 4, they had hashed out the final version, and voted to adopt it. Hurray! Mr. Harrison reported, that the committee of the whole Congress have agreed to a Declaration, which he delivered in. The Declaration being again read, was agreed to as follows: [text of the Declaration]. Ordered, That the declaration be authenticated and printed. That the committee appointed to prepare the declaration, superintend and correct the press. That copies of the declaration be sent to the several assemblies, conventions and committees, or councils of safety, and to the several commanding officers of the continental troops; that it be proclaimed in each of the United States, and at the head of the army. And as that also shows, there wasn’t even a formal copy yet—it still had to be “authenticated and printed.” After all, they couldn’t just click “Print,” so unless everybody gathered around to sign the final marked-up document, which seems unlikely, they need to get a scribe involved. They did have somebody print up copies that could be distributed quickly; that happened on July 5, but only two names (the President and Secretary of the Congress) were on the printed copy. (By the way, only 26 copies of that thing are known to exist. If you find one, it’s probably worth upwards of $8 million.) But there was no “fairly engrossed” copy on parchment until August, and most of the signers signed that on August 2, some not until later. Maybe somebody did sign something on July 4, but if so, that thing no longer exists. It doesn’t really matter, of course, because the Declaration itself has absolutely zero legal significance. We were already acting and claiming to be independent before July 4, 1776, and if we hadn’t somehow managed to win the war, all those signatures would have accomplished is to provide a handy list of people to hang. But we did, and even though the Declaration still has absolutely zero legal significance, it has of course developed enormous symbolic significance. At a minimum, it got us a four-day weekend this year, and for that, at least, let us salute the wisdom of the Founders. The success of their little experiment here seems doubtful at the moment, but fireworks are cool.